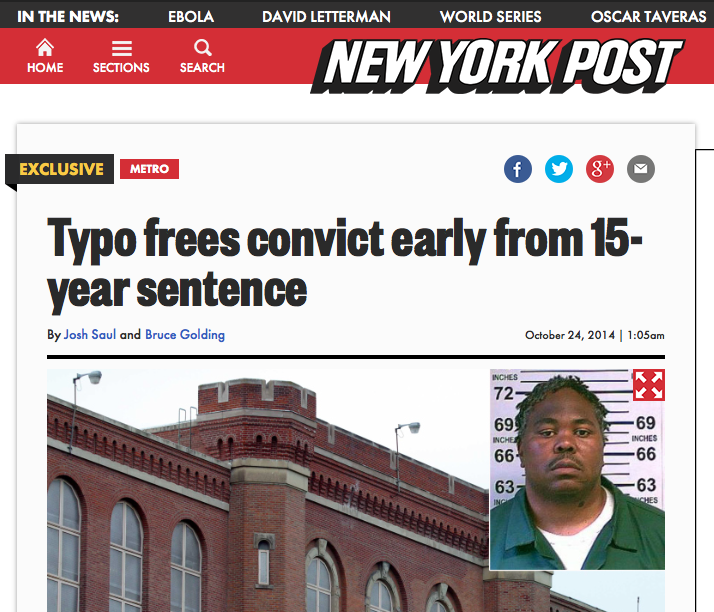 Kevin Langston, the New York Post reports, who was given 15 years in jail for his part in a gun-running operation, “is about to get sprung from the slammer early” because of a mistake: the court’s official record shows he was only given a sentence of five years. According to the Post, “prosecutors say the transcript showing the shorter term was missing a ‘1’ due to ‘an error by the court reporter’, who has since retired and can’t be found”. But the appeals court does not see it as being nearly so straightforward, and has now ruled that Langston had “acquired a legitimate expectation of finality” with the five-year sentence. As the Brooklyn Daily Eagle points out, although the court did have the power to amend the errant transcript, it went uncorrected for seven years. The ultimate decision in the case – the DA’s office is reportedly “weighing its options” – will be a complex one, likely to involve discussions of double jeopardy (for example, whether any change in the transcript would mean Langston was being sentenced twice for the same crime). But the central problem is a very familiar one to anyone who, like me, used to work as a legal editor: in court, typos are not a trivial matter. Years ago, while working on a book about bills of lading and maritime law, I was proofreading extracts from widely used bills quoted in the text against the original documents. Quite by chance, I discovered that a significant chunk of one popular bill’s terms and conditions had gone missing from the latest official reprinting of the form. They were present in our book, quoted from the previous version, but absent from the small type on the new document itself. I drew the author’s attention to this as a curiosity. Somewhat to my surprise, he not only got in touch with the issuing authority – which confirmed this had been an accidental omission – but insisted on reopening that chapter to explain what was absent, concluding that, legally, “the effect of this is unclear, to say the least”. Whatever the upshot of a hypothetical dispute over the missing clauses on that form might have been, it was clear that they could not simply be taken as read. In descriptivist linguistics, what is meant ultimately takes precedence over what is said: this is why double negatives become intensifiers, “head over heels” means “upside down” and “irregardless” means the same as “regardless”. But in law, and in legal editing, it is frequently the other way round. What is said can trump what is meant – even if there was no confusion about intent; even if there was a mistake. This is why when you’re editing a court report – or writing a headline that might one day appear before a judge – descriptivism may not be enough to save you. When the lawyers are hovering, it’s not enough to know what you meant; you have to know what you’ve said.